Why was not it sighted ? or words were like hieroglyphs ? This is arsenic, pain not again ! To decipher the top as the lower ! I promise, je promets, lo prometto – the last and final revision of this edging. And I do apologise for putting my dear readers through this yet again - March, April, and now May, oops - the mummy rises again ! This is an image from the original Georgia sent me, for working out the sequence and diagramming. Here all 5 rows were tatted separately, with tie and cut after each. During my first revisit of the tatted edging from Coats and Clark (Book 121, Pattern 295), without specific guidelines, I didn’t want to change anything, except climbing out of rows for a continuous tat. Hence rows I to IV were tatted as one continuous unit. Then tie and cut. And row V was worked separately. Yet confusion persisted. Eyes went straight for the diagram, skipping the written matter which was highlighted through colour coding, or within boxes and the tatting sequence was the first thing on the page ! They were Not hieroglyphs, were they ?! I recently finished reading The Brain by David Eagleman and it is an 'eye'-opener to see how our brain takes over all our perceptions, sensations, knowledge, learning, comprehension, actions and reactions. Why ? Because then Row I became oriented correctly – the way we would tat it. Another TWoT lesson for diagrammers. So I give you yet again, the re-revised reoriented and this time stand-alone pattern for the edging. download reoriented diagram-only pdf here. Since I was going through it all again, and I didn't want to show you the same old pic, I tatted another sampler, this time in black size 50. And I also made another pdf this time with the pattern in written notation too. I know you must be bored, but hey, “I’m picky” ;-P And hopefully no hieroglyphic this time! I will be striking out all previous pdfs to avoid confusion in future. This little project was worked in 2 days flat – from ideation to execution to presentation – so that we could have a surprise paperclip pattern before end of April. You know that I am not proficient with beads or their terminology, etc. So there were many senior moments here. Only later after pdf was made and sent (in record time for me! And this included a quick test tat and valuable feedback from Phyllis), I emailed Nina Libin for info and she graciously explained the correct terms along with links (which helped immensely during class). Georgia also shared links I didn’t know about, in class. I have used those terms & links in this post. It all started when I saw a jewellery ad in the newspaper and wondered if I could get beads to stay positioned as free-floating rays using a shuttle. I had an idea and quickly searched for similar projects & tutorials but as often happens, nothing came up close. 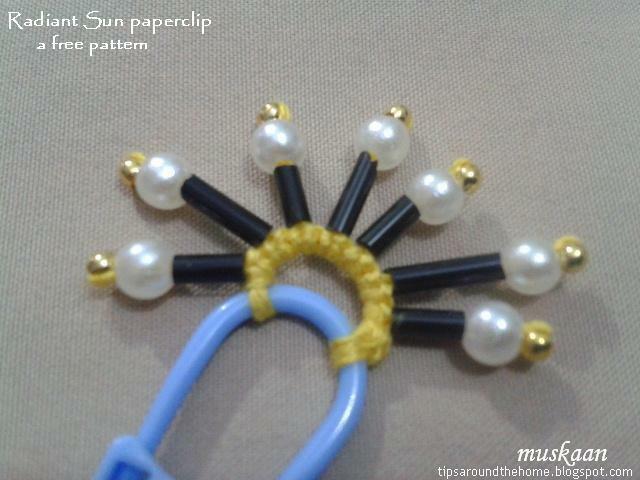 Pattern is a simple chain with beads radiating freely around . To execute my idea I needed the end/stopper bead to be large. Pull back the extra length of loop, ensuring that the wrapped thread stays tightly noosed around the bead. Pretty simple, easy, and no extra tools required. Now to put it to the test, I started to tug at the pearls – 2 stayed in place, but one fell off. One can use this method only if the piece is going to lie flat – glued or appliqued, and not worn/used. 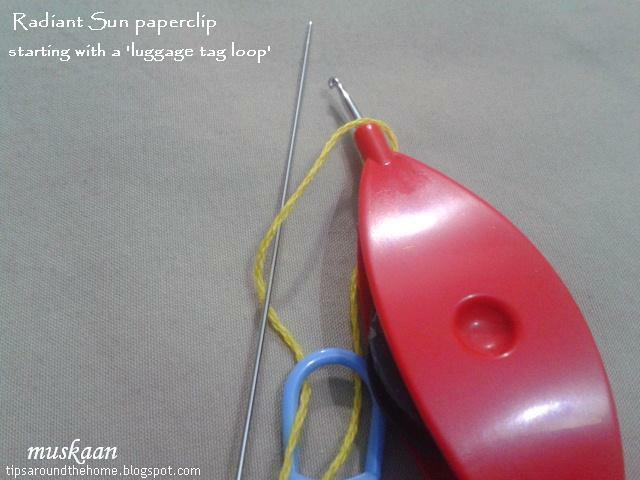 A 'luggage tag loop' is used to start. It creates a complete double stitch. Care must be taken to keep the shuttle to the right. 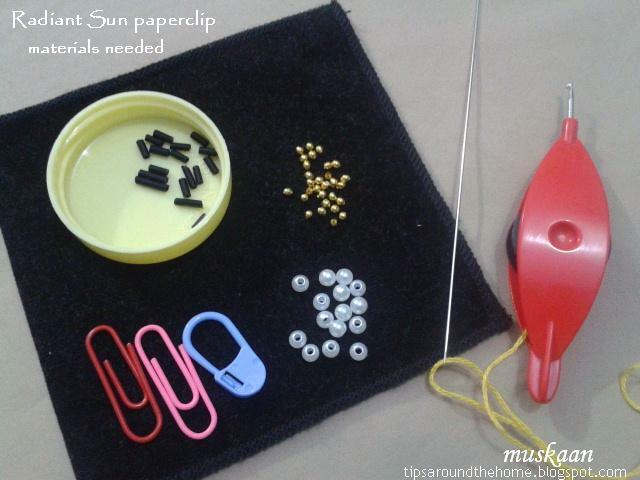 I chose a blue clip for sky with the yellow sun emerging. For the right shade, I used 3 strands of Anchor embroidery thread. If I leave tails on both ends, doesn’t it look like a headdress ?! single shuttle medallion prototypes with pattern and dot picots on a ring ! Usha told me about a challenge her whatsapp group, Happy Tatters, is doing – tatting a single shuttle medallion or motif daily for a week. While I am not on any SM, InTatters members will certainly remember the gorgeous doilies tatted by Madhur, who is also a member. What better way to get one’s creative juices flowing ?! I let my shuttle loose. A couple of mangled attempts were thrown away (I keep forgetting to include picots). The ones that have survived so far are these … still in the process of completion. But if I waited to show till each was complete, it’d take forever. I find myself using different techniques to overcome the ‘handicap’ of a single shuttle. To my pleasant surprise, there is hardly anything one cannot do with a single shuttle !!!! I am really enjoying this challenge and drawing on all the techniques I’ve learned so far to tackle each piece differently. Round 1 : comprises of twin rings separated by tiny half rings. Repeat 5 times total, ending with a join to base of first ring. Do not cut thread. Round 2 : This round is made up entirely of large half rings, joined to previous round using onion ring join for a slight texture. Make a LJ through bare thread of last HR in Round 1. Repeat 6 times total, joining back to start. T & C. Hide end or use as dangler. One can use Anne Dyer’s Join to smooth side (JSS) instead of onion ring join, but I wanted a subtle dip. Pull loop of the other thread through picot, pass shuttle through, tension; make 2nd half stitch. I wanted more rings in the center, but that wasn’t going to work. Hence left it as a diamond, to ramble along the next round. Made in one pass with 4-ring rosette in center, and half-closed folded rings (setb then seta) and Josephine rings , lock joined (twice – on either side of JR) to the picots in Rnd 1 rings. It does seem to have a diamond in center and an elongated hexagon along outer edge. This one will probably be discarded; still, grist for the design mill. This was actually just the first round. But I kinda like the look of it as a tiny flower. Note : for picot join to the right, one can use a folded join, rosette join (twisted picot join) or avoid a folded join, since these are outward facing rings. ***Leave about ½” bare thread. Tat 1 JK (7hs). Twist bare threads to make a picot with JK at tip. 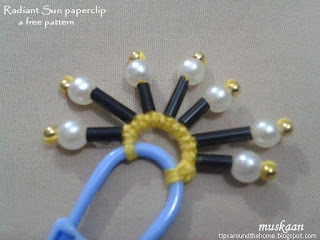 Repeat till end, joining last ring to the first using a picot join to the right, and another twisted picot with JK. Tie & Cut, hide end. Dot Picots on a Ring ! This started out as a medallion too, but I got into experimentation mode. I started with SCMR using a length of tail (smallest ring). 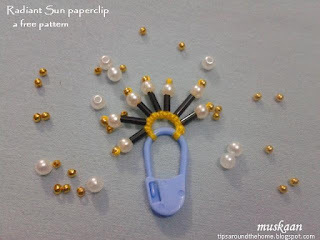 easy to make dot picots here since it is basically a chain. Middle ring is a true ring with dot picots, but they tend to unravel (middle one is fully unraveled, while the right one is beginning to) . Large ring was another idea to secure the dot picots – and it worked ! A wee bit fussy initially, but very much doable. Those bare threads visible on the left of the 3 dot picots was left on purpose – I wanted offset picots. The BTS needs some tweaking to get my visualized effect. I started another medallion last night, using other techniques. But no pics yet, and is still unfinished. Anybody game for a similar challenge ? More of my Single Shuttle motifs /medallion patterns : Jewellery Medallion , Ring in the Bouquet , Inchies. how to avoid gapsosis in thrown rings and birdhouse squirrel ! Nothing new here for experienced tatters but do scroll down for the latter. Newer learners often face a problem of gapsosis in case of thrown rings and especially thrown ring clusters such as trefoils and clovers. voilà, now you can release from the pinch, unfold and continue with chain tatting normally – the gapsosis has been avoided and the thrown rings will sit close upon the chain. NOTE : this same fold, pinch, and tat is equally effective with trefoils and clovers when a normal chain follows it after RW (reverse work). with no core thread left. Release the pinch and unfold Only After 1 full double stitch has been made . In case there is still a gap, untat the 1ds and do over. This works for me. There may be other equally effective ways, too. A few previous posts about gapsosis – how to avoid and also when/how it can be useful. I will talk more about this snowflake in next post, in response to a tatter’s dilemma. And here is our birdhouse resident for this season. Not a bird, but a squirrel !!! We've had this birdhouse for over 2 decades and except for the first couple of years, no bird has made it's nest. Squirrels, do stash their pickings before winter, using it as a storehouse. But this time we have an actual resident for the last few weeks and can see it sprawling on the roof every evening ! These pics were taken through out French door glass. Hope to take a few more with doors open, and a closer view. Techniques : 2 shuttles, thrown rings, fs/bs tatting, clovers, picot join to the right*. I did the central ring separately in embroidery thread. The outer part was worked continuously in 2 colours. What attracted me to this medallion is the changes in chain orientation ! And with the use of 2 colours, I was able to highlight these shorter chains. In order to do it, I switched shuttles, but did not reverse work (SS, DNRW). Voila, the curve of the chains changes from convex to concave when seen from front. Before starting the join, make 1fhs, then a picot join with up loop, then continue with rest of pattern. That extra stitch is barely seen in fine thread. In tatting and joining an element backside (RODS), the joining loop follows 1shs. In this star the last element was a chain to be joined to a ring; though most often we end up joining the last ring to first ring in a medallion. Okay I can hear you groaning and muttering "not another term!!!" But think about it - if you read down the list of folded joins and avoiding them, there are many other terms that mean the same and do the same job. Yet, there are questions and queries and confusion about when, whether, or which join to use. The Common Thread is that ALL THESE JOINS ARE MADE TO AN ELEMENT ON THE RIGHT OF THE PRESENT ONE. In majority of our tatting, the picot join is made to an old element/picot which lies to the LEFT of the present one. It is only when the old element lies to the Right, that we need to either twist a picot, fold the work, or reorient the work in order to make a connection. Hence this grouping under the heading "Picot Join to the Right". Once we have this category, How we go about accomplishing it is our own prerogative. But at least now beginners know that a 'different' tweak is required. I had the pleasure of test tatting a snowflake which had square rings. Jumped at the opportunity to practice square rings. The only time I tried a couple of these was 3 years back & at the time I was still groping my way through the plethora of techniques. Nothing to write home about. The highlight of this flake is obviously the square ring oriented like a diamond. I experimented a lot with the square rings, starting with Christiane Eichler’s method. It is very effective. But you have to work with 2 taped shuttles throughout the entire pattern, which slows down the speed of tatting (unless you have those double bobbin shuttles). Hence I really liked Phyllis’ practical tweak where she uses only bits of spare thread limited to the square ring. Rest of pattern is worked normally. Even with spare thread, I tried a lot of variations and all seem to work just as effectively – same size, smaller size, embroidery floss, different colour, etc. – once we get a hang of the technique, and close the ring tight. But I will still recommend 3 strands of embroidery thread for size 20 whether in same or different colour – the colour does not show up; being less tightly twisted, it grips the stitches within; it is finer than size 20; and it is easy to find the right shade. Don't be afraid to pull the spare threads tightly and finally close the ring tightly at the very end, after you are satisfied with the angular shape. I tried to make squares - rings or mock rings - using single bead on core thread, 1ds SCMR, dot picot, padded stitches, to name a few. The padding can be along core thread as in the 2 methods above, or padding can be on the stitch. See Phyllis' own working here, including a beaded version. (along with my twisted picots in the Snowflake Sparkle, I think). The top left is my first test tat ; the lilac is the final version. One of the spare threads in the latter is yellow coloured, but not visible even from up close. TIP : And no, the spare thread does Not unravel. Yet to ease my paranoia, after closing the ring, I made 1 unflipped second half stitch, encapsulating the spare thread tails, then continued with chain normally. And further, I snipped them close, only after blocking, thus ensuring that the fibres caught on and held their place. Techniques : 2 shuttle tatting, lock join, square ring, thrown rings, mock picot. It is worked all from the front, in clockwise direction. I did not do the unflipped half stitch before starting the square ring. Blocking (for shape only) and stiffening is recommended. Besides practicing square rings, I learned a lot from this test tat. Phyllis is so organized and precise in her response and resolution to all feedback. I have already applied this learning to some extent with good results, while testing/corresponding with Usha. Midways, I also became comfortable with Google Docs with it’s comment boxes, et al. Saves so much time ! am now sending it into outer space. That colourful bead box is one of my new acquisitions & I love the turning slotted lid !!! It opens only the desired bead segment, and keeps the rest in their place. Yes, I snipped off the picot between rings in the green flake!!! But first I put a spot of fabric glue on each picot, let it dry, then clipped. Sewed in the blue seed beads with single strand embroidery floss, going through both flakes. Inserted the clear marble towards the end. A slightly larger marble would be ideal, but I had only these or much larger marbles in my stash. Stiffened on the back with very slightly diluted liquid fabric starch/stiffener. It dried invisible. hope you enjoy tatting this as much as I did. you don't take the bite ? Is she daft, you ask ?! A tatted ring is tear drop shaped and everybody knows that !!! Ah, but when we tat a ring, what do we call the 2 threads dangling beneath - the ones we dread coz they need to be hidden ? Tails (thread tails, tail ends) , correct. And what does the opposite end look like - the one that is broad ? Add an eye Picasso-style, and what have you ? And this broad head determines how the rings are facing in a medallion or in a motif. how to read tatting diagrams, etc. It also makes it easier to explain to others – see images below. This is applicable to medallions which enclose a space, and also to rows and rounds in larger patterns - how are the rings joined - inwards or outwards. This also determines the overall Direction in which we work that row, round, or medallion - left/right; clockwise/counterclockwise. This in turn can help us decide what to tat backside in case of directional or fs/bs tatting. The pdf shows how to identify inward and outward facing rings in a medallion or pattern, using fish as an analogy for a tatted ring. The pdf is largely graphic. While it is important to know and understand tatting terms, the future of tatting is going visual. Be it books in languages we do not understand and rely only on the diagrams they present, or videos, it becomes important to understand, at a glance, what skills and tools we require. So, head in the right direction - follow the head of the fish ring ! are the fish trying to get away from each other or from a fisherman's bait ?! the fish are in a huddle, with their heads knocking each other ! With a fish analogy, it becomes Quick and Simple to tell at a glance and in a couple of words! While I was working on the pdf, unknown to me, Sandra Figg was working on this video to show us the difference (we both saw the need, generated out of the same discussion thread!). The pdf has a few basic terms such as motif, trefoil, clover, medallion, scroll, etc. Hopefully beginners will have no problem in understanding them, and others in identifying which is which. In case help is needed, I will explain them briefly, with comparative images/collages in next post. Your feedback is awaited. Please leave a comment or email. This layered pattern has been shared here. Tatted throughout with 3 strands of Anchor embroidery threads. Probably a size 30. Techniques : 2 shuttle tatting, split ring, mock picot, dot picots, dots, thrown rings, decorative join, lock join, long or decorative picot join, rosette, bare thread space, fs/bs tatting. I wanted a floral look, with emphasis on the black, hence the choice and placement of colours. Rounds 1 & 2, worked continuously, form the foundation of this medallion. After climbing out with split rings (remember to leave BTS on both sides of the SR while climbing out, and a very small mock picot before SR of rnd 2), I switched shuttles. Thus I could work the chains and dot picots and thrown dots frontside, using SH1. 8m thread in SH1 was completed depleted , and barely 2m in SH2. That worked out well – no short scraps left! Both rounds were worked clockwise because of switching shuttles. I blocked only at the very end, hence the tatting is not as flat as should be. Round 3 is the highlight of this pattern, worked Over the previous round, creating a layered effect. The decorative lock joins form a lovely ‘V’ at either end of the ring. It is made in the same way as in these cute flowers here. This is how I did it : Make sure the chain stitches are snugged properly. Place the core thread over/across* a ring, and pull out a loop through the ring and above it. Pass shuttle through loop as in any lock/shuttle join. Tension just enough that it does not distort the ring. Now this is lock join that is easy to undo !!! * I didn’t like the end look of the join when loop was pulled up instead of down. Rounds 4 & 5, worked separately, are rosettes or flower medallions, attached ‘above’ ! Worked with single shuttle, the rings are separated by bare thread, and joined cleverly to the rounds before, through the ring ! These are simple picot joins, but with visible lengths of the loop that go round the ring base. These are worked in the same was as the long or decorative picot joins shown in these flowers. All 5 rounds were worked in clockwise direction. Although if shuttles are not switched after round 1, then round 2 will be worked counterclockwise. There’s a lot going on in this cleverly constructed and enchanting pattern, yet it is all pretty simple to work. I got to play with some of my favorite effects of layering and intertwining.